Anyone who's anyone in the creation/evolution debate thinks they know where young-age creationism came from. Some think it originated very recently from the book The Genesis Flood by Henry Morris and John Whitcomb. Others (slightly better informed) place its origin in the context of the fundamentalist movement and especially the Scopes trial. Even better informed people (like Ron Numbers) blame George McCready Price and ultimately SDA prophetess Ellen G. White. All are proceeding under the assumption that creationism is a relatively recent aberration, properly understood in the context of religious reaction to Darwin's Origin of Species. Just when the pseudo-flap over Creation and its distribution is dying down, news comes of two more creation/evolution-related film productions. The first is a two-hour NOVA special titled Darwin's Darkest Hour, which chronicles the writing of Origin of Species. Hmmmmm.... seems familiar. Playing Darwin is Henry Ian Cusick, known to most Americans as Desmond, the man who pushed the button in the Swan Station for years before Jack, Locke, and the rest of the Losties blew the hatch open with dynamite. The special airs October 6. Check your local listings for the exact time. I sincerely hope it's interesting and entertaining. Novo et al. 2009. Eukaryote-to-eukaryote gene transfer events revealed by the genome sequence of the wine yeast Saccharomyces cerevisiae EC1118. PNAS 106:16333-16338. Gene transfer is extremely common in prokaryotes, but it's fairly rare in eukaryotes. Novo et al. sequenced the genome of S. cerevisiae EC1118 and found three regions totalling 120 kb of DNA that had been transfered in from at least two other yeast species. These weren't just transposable elements, but contained some genes used the winemaking process. As I said, this kind of transfer of metabolically-useful genes is common in bacteria but not well-known in eukaryotes. I wonder if this is also common in eukaryotes, but we just haven't noticed it? It certainly raises the question of how these genes get transfered. This week's PNAS has a special feature called "Out of Africa: Modern Human Origins." All the articles are open access and worth looking at. Tattersall. 2009. Human origins: Out of Africa. PNAS 106:16018-16021. Weaver. 2009. The meaning of Neandertal skeletal morphology. PNAS 106:16028-16033. Hublin. 2009. The origin of Neandertals. PNAS 106:16022-16027. Richards and Trinkaus. 2009. Isotopic evidence for the diets of European Neanderthals and early modern humans. PNAS 106:16034-16039. Hoffecker. 2009. The spread of modern humans in Europe. PNAS 106:16040-16045. Rightmire. 2009. Middle and later Pleistocene hominins in Africa and Southwest Asia. PNAS 106:16046-16050.
d'Errico et al. 2009. Additional evidence on the use of personal ornaments in the Middle Paleolithic of North Africa. PNAS 106:16051-16056. The movie was generally well-received when it opened Toronto two weeks ago, though given its period aspects, found a slightly tougher acquisitions market. ...we propose, as a first attempt at classification, dividing all microbes into two groups: 1) the free living organosubstrate microbes and, 2) microbes associated with metazoan organisms (Wise pers. comm.). The organism-associated bacteria would not be considered as independent free living microbes but instead as extra-corporeal or extra-cellular organelles and tissues. Thus, humans would not be considered as mosaic creations but as individuals created in the image of God who contain both prokaryotic and eukaryotic cells and tissues. 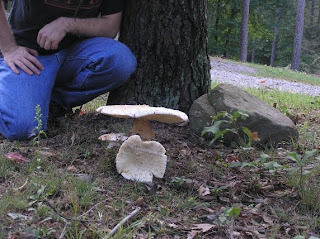 Guess what happens when it rains for two weeks nonstop in east Tennessee? The mushrooms get big, develop sentience, and begin plotting to take over the world. I found this particular specimen in my yard. In Am J Bot, Karagatzides and Ellison found that the cost of building a trap on a carnivorous plant is less than building a leaf. Why do I care? I like carnivorous plants. In Science, Zhang et al. developed a 3D structural look at the central metabolic network of the thermophilic bacterium Thermotoga maritima. Not sure why this merited a Science publication, but I've got a soft spot for protein structural biology. And in the world of transposable elements, the genome sequence of potato famine pathogen Phytophthora infestans had a plethora of repetitive sequences. Katzourakis et al. found an endogenous foamy retrovirus in a sloth genome. Haas et al. 2009. Genome sequence and analysis of the Irish potato famine pathogen Phytophthora infestans.Nature 461:393-398. Creation and the creationist boogeyman! You might remember earlier this week, I was ranting about the producers of Jon Amiel's new film Creation about Charles Darwin. Seems the film hasn't yet been picked up for distribution in the U.S., and the producers were blaming the creationist controversy for scaring away distributors. I thought that claim was nonsense, especially since so very many controversial films get picked up for distribution. Conservative Christians don't determine what you see in theaters; the almighty dollar does. If there's a buck to be made, some company will distribute it. Some of you might recall that CORE and the Bryan Institute for Critical Thought and Practice hosted a symposium in February titled "War and Peace: 150 Years of Christian Encounters with Darwin." The speakers were myself, Ted Davis (Messiah College), Jon Roberts (Boston University), Steve Matheson (Calvin College), and me. I summarized the event here. I've been reading the latest issue of Genome Research lately, and there's a lot of interesting material in it regarding human genome variation. "Of Sound and Fury," an award-winning documentary about the Scopes Trial produced by the staff of Timberlane High School in Plaistow, N.H., will have its premiere showing Sunday at the Rhea County Courthouse at 2:30 p.m. The Timberlane drama department produced the play "Inherit the Wind," and teachers wanted their students to understand the difference between the plan and the historical record, hence the documentary. Because of the assistance rendered to the production staff, Bryan College is credited as a co-producer with Timberlane and Pulitzer Prize-winning historian Dr. Edward J. Larson. The documentary will be presented as the program for the regular meeting of the Rhea County Historical and Genealogical Society, and all are invited to attend. For you local readers, the journal club schedule for this fall has been posted at the CORE website. Journal club is a time for interested faculty, staff, and students to get together and discuss recent papers and research in creationism. We've got an interesting schedule this fall, and we always have a good time. This semester, we'll meet in Mercer 139 at our usual time of 5:00 on Tuesdays. If you're in the neighborhood, we hope to see you there. While I was home for Christmas, I visited my favorite antiquarian bookstore in East Lansing to find that it had been remodeled to about half the size it used to be and the bookstore cat died last year. Bummer. 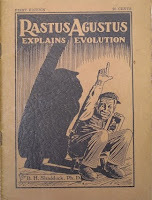 Then I found Rastus Agustus Explains Evolution, a first edition in pristine condition, and that sort of made up for the lack of a kitty rubbing against my leg while I browsed. RIP, Moe the cat. I'm making no effort to systematically record reactions to the new Darwin movie Creation. I'm just posting reviews as I find them. If you want systematic, go to Rotten Tomatoes. The latest issue of PNAS has two articles of interest to creation biology. The first is a piece on the origin of cholera. Chun et al. studied 23 genome sequences of pathogenic Vibrio cholerae isolated over the past 98 years. They found that recombination and lateral gene transfer are important factors in the emergence of different strains of the pathogen. As I noted before with malaria, the origin of pathogens and natural evil can be quite complicated. In this case, the origin and persistence of Vibrio pathogens by lateral gene transfer is quite interesting, given what I've speculated in the past about genomic modularity. The Toronto International Film Festival opened last night with Creation, the new Jon Amiel film about Charles Darwin starring Paul Bettany and Jennifer Connelly. Here's Ebert's reaction. It's not a review but more of a commentary, and I'm somewhat torn by what I read. Some of the details Ebert gives are clearly melodramatic flourishes (Charles walking out of a sermon on Genesis, Emma's "fervent" Christianity, Annie's alleged contribution to embolden Charles to publish Origin), but then making a movie of someone's actual life would be a boring affair without a little drama thrown in. I wonder whether the movie will wallow in the alleged faith/science conflict or merely skirt that issue? Ebert says that it is never dealt with directly, which I find slightly reassuring, even if the added bits of drama cause me to roll my eyes. Having been in this creationism game for a long time and involved in Christian higher education for nearly a decade, I occasionally run across students or colleagues with a particularly bothersome attitude. It goes something like this: "I want to get involved in creationist ministry, and I need a degree so that people will listen to me and not just dismiss me as a crank." This attitude is not terribly common, but it is pretty demoralizing when I encounter such folks. Having just run into it again, I thought I'd post a few thoughts that might be useful to future students. TMC president Emir Caner is quoted saying, "Make no mistake about it, the appointment of Dr. Wise will allow Truett-McConnell College to surge forward in once again marrying the fields of science and theology." That's pretty exciting. It's nice to see the ranks of colleges genuinely interested in creation growing. I've been doing this blog thing for nine months now, and I decided I'm tired of looking at that old light blue template. So I'm giving this a try instead. I'm not sure I like it, but it's different. And to make this post not entirely useless, read about Rock Dissolving Bacteria in Desert Cacti at Paul Garner's blog, or check out Steve Matheson's revelations about that stupid weasel program everyone is yammering about. May I add to Steve's frustration the simple observation that Dawkins's program was nothing more than an illustration. It means no more than any other over-simplified classroom demonstration, which is to say, next to nothing. The hysteria over Dawkins is analogous to getting upset because the proteins illustrated in my biochem textbook have fancy colors which they don't have in real life. It's just illustrative. Get over it already. to create a worldwide sense of unity in promoting this belief in a positive light.The Loma Linda University Church is having a "Celebration of Creation" that weekend, where you can hear presentations by Art Chadwick, Leonard Brand, Raul Esperante, Jim Gibson, Tim Standish, John Baldwin, and others. If I were in the neighborhood, that would be a conference well worth attending.